There are a variety of levels, each with signature visuals and corresponding special weapons and traps. There have been more times than I want to recall where a lucky shot sent me into lava pits or rivers below. 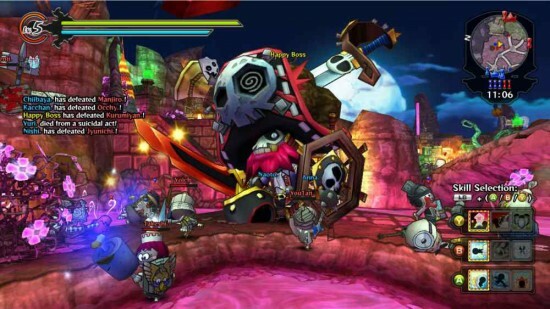 Most interesting about Happy Wars is the game’s focus on cooperation. When working together properly, a team is able to accomplish group maneuvers that can cause massive damage or quickly take down opponent’s defenses. With a team having half its members putting together a battering ram while another group scales a wall, the defending party can fall rather quickly. Unfortunately, since it is a free game and some people on don’t try to “play properly”, there are going to be times that no matter how much you try, you aren’t going to receive any support from your teammates. In addition to the now standard addicting features of multiplayer games like experience and leveling, players also get customization to play with. As players progress, they earn coins. These coins are used in a roulette wheel style game of chance that unlocks different items of various rarity. Players can decide which type of item they want to push for, whether it be weapon, armor or accessory, and use it to customize their three loadouts. Additionally, Happy Wars comes with monthly challenges and offline episodes that players can go through to gain additional coins. Because of this, you never feel the need to pay for any of the items in the game to be on the same level as other players. 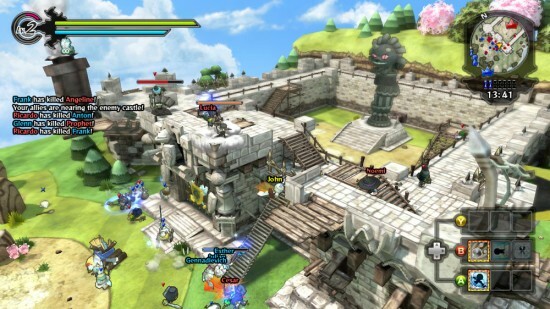 Happy Wars is an ideal download for anyone looking for a low pressure multiplayer title on XBLA. You don’t have screaming 12 year old trolls in your ear like you would for a game of Black Ops but you can hop in for a quick battle and move on with your day. Even six months since its release date, the servers remain fairly full as well allowing for quick matches to pop up at pretty much any time too. Hi there, You have done an admirable job. I’m going to surely bing this plus in my personal perspective advocate to my local freinds. I’m comfortable they’ll be benefited from this web site.